The new KTM 250/350 and 450 motorcycles marked the Austrian manufacturer's first development of linkage suspension for serious motocross and off-road applications. Many consumers have experienced a difficult balance in overcoming the initial harshness of the new design, followed by a lack of bottoming resistance when traveling deeper through the suspension stroke. The harshness of the initial stroke results in a loss of traction and rider discomfort, while the lack of resistance close to the limits of travel, causes premature bottoming. The end result is a somewhat "wallowy" ride that loses forward momentum during aggressive riding that is tiring to the rider. Only incremental changes can be made through revalving and external adjustments, but the only true solution is to replace the linkage and mathematically alter the leverage ratio. 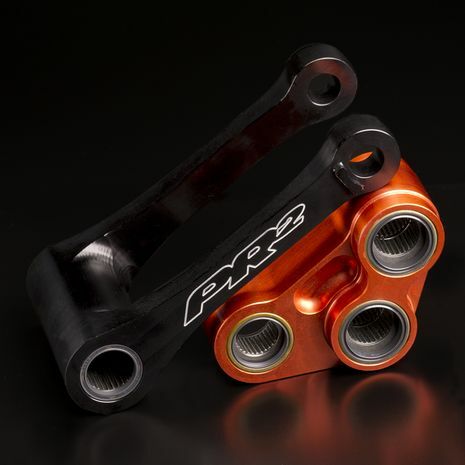 The PR2 KTM Linkage System is engineered to change the rear suspension progression to greatly improve the initial travel response while improving the bottoming resistance throughout the remaining travel with a smooth, linear transition. Our PR2 KTM Linkage System has been tested across a broad range of riders and types of riders. We are proud to say that off-road and motocross, professional through vet racer, the positive feedback has made our engineering efforts very rewarding. We invite you to unlock the full potential of your new KTM too!